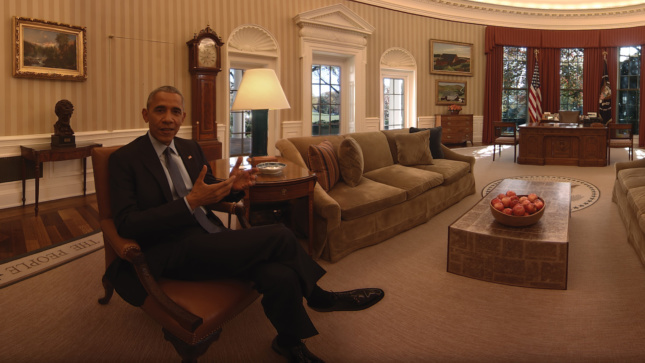 At Tribeca’s “immersive” Virtual Arcade, the virtual reality (VR) film The People’s House offered a tour of the public and private rooms of the White House with tour guides Barack and Michelle Obama. Highlighting artifacts and artworks as the embodiment of the philosophies and policies of their administration (Michelle cites Alma Thomas’s painting Resurrection, 1966, in the Old Family Dining Room), it is a stark reminder of how quickly life has changed. It was comforting to think that The People’s House is a vessel that will continue to change as administrations come and go. 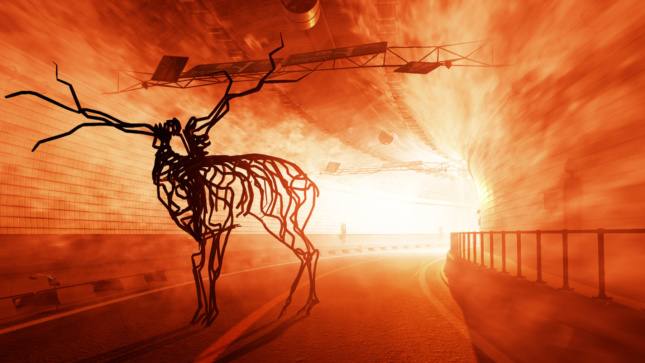 The following is a rundown of films and VR installations that use architecture and art that appeared at the recent festival, and that you should look out for. A few referred to the dilemma of finding or keeping housing in New York City. The Boy Downstairs finds Zosia Mamet’s character locating the perfect Brooklyn apartment when she returns to New York from a few years in London; her character is granted approval by the resident bohemian landlady who takes her under her wing, only to find that her ex-boyfriend is in the basement apartment. Will real estate triumph over emotional health? Black Magic for White Boys is an independently produced TV pilot where New York real estate plays a key role: a landlord is frustrated that he cannot raise his tenants’ rent, a magician hatches a devilish plan to save his small theater, and gentrification is causing an older version of New York to fade away. Permission finds woodworker Will (Dan Stevens) fixing up a brownstone for his long-time girlfriend Anna (Rebecca Hall), to whom he can’t quite propose. As they begin to experiment with other people, Will’s handmade furniture and house are no longer creating a home. I LIVED: Brooklyn investigates the borough’s distinct neighborhoods. 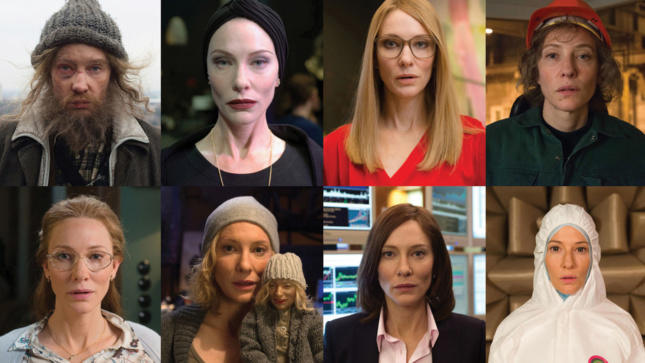 If you missed Manifesto at the Park Avenue Armory, its segments have been woven into a film featuring Cate Blanchett playing different characters (newscaster, homeless man, puppeteer, punk rocker) who deliver architecture manifestos by Bruno Taut (1920/21), Antonio Sant’Elia (1914), Coop Himmelb(l)au (1980), Robert Venturi (1993), as well artists’ manifestos including Marinetti’s Futurist Manifesto, Lars von Trier’s Dogma 95, and others on Dadaism, Surrealism, Minimalism, Pop Art, Situationism, Merz, Spatilaism, and The Blau Rider written by Tristan Tzara, Kazimir Malevich, André Breton, Claes Oldenburg, Yvonne Rainer, Sturtevant, Sol LeWitt, Jim Jarmusch, Mierle Laderman Ukeles, and others. Artist Laurie Simmons stars in her directorial debut, My Art. Although her character has been able to sustain her life as an artist by teaching, she has not broken out, while her students (real life daughter Lena Dunham’s character, for example) and friends have. 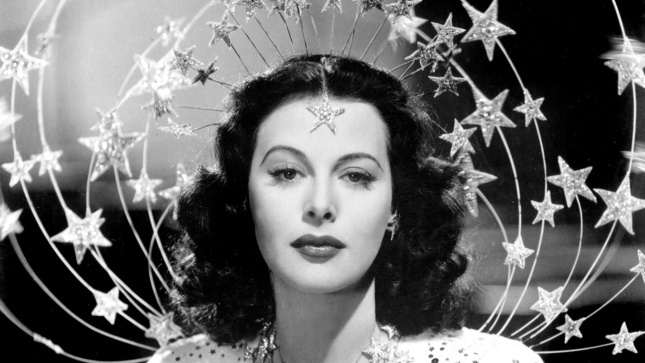 She accepts the summer loan of a gracious summer house, complete with gardens and pool, and spends the summer making films that recreate Hollywood films. These finally give her both the satisfaction and attention she craves. Scenes take place at the Whitney Museum and Salon 94 Bowery. 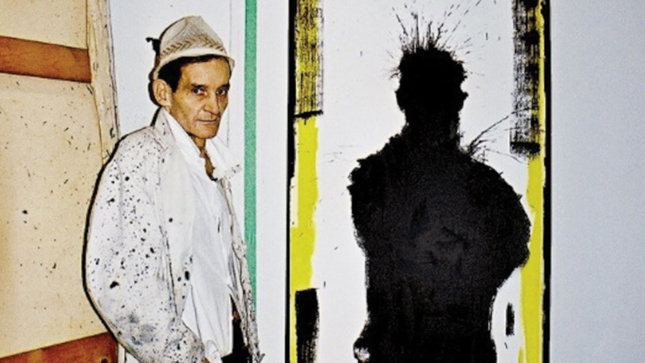 Shadowman is Richard Hambleton, a street artist who was part of a trio that included Jean-Michel Basquiat and Keith Haring in the 1980s whose work appeared all around New York City streets. The other two became art stars, their work came inside to galleries and was widely collected, and both died young (drug overdose and AIDS). Although Hambleton at first attained commercial and critical success—featured in LIFE magazine, and with works displayed at the Venice Biennale—he spun out with homelessness and an addiction to heroin. The film chronicles his rediscovery and a planned comeback, sponsored by Giorgio Armani, with Hambleton still painting his mesmerizing shadow-like figures. Movingly, he says that although he is still alive while his fellow artists are not, he is the waking dead. What a contrast to Julian Schnabel: A Private Portrait, which chronicles this confident, gregarious artist and filmmaker from his childhood in Brooklyn and Brownsville, Texas, through his rise as a Neo-Expressionist painter (remember his plate paintings?). Schnabel came to be acknowledged for his extroverted, excessive approach to his work and life (frequently seen in silk pajamas, he lives and works in Montauk, Long Island, and in a 170-foot-tall pink Venetian-styled house in the West Village called Palazzo Chupi) as he moved into filmmaking (Basquiat, 1995, Before Night Falls, 2000, and The Diving Bell and the Butterfly, 2007). We have access to Schnabel and to friends and colleagues Al Pacino, Mary Boone, Jeff Koons, Bono, and Laurie Anderson. Schnabel is one of many art luminaries who appear in Blurred Lines: Inside the Art World which lifts the curtain on the art world economy, or the glamorous and cutthroat game of genius versus commerce where art is created, exhibited, and sold. Museum directors (Glenn Lowry, Michael Govan), collectors (Michael Ovitz), auctioneers (Simon de Pury, Amy Cappelazzo, Lisa Dennison), gallerists (Iwan Wirth, Andrea Rosen), artists (Rashid Johnson, Marina Abramowitz), and many more, appear. Another crash and burn, but with a comeback, is Zac Posen in House of Z, the name of his fashion house. Son of an artist father, he attended St. Ann’s in Brooklyn with Stella Schnabel, Paz de la Huerta, Claire Danes, and Jemima Kirk, for whom he created outfits. 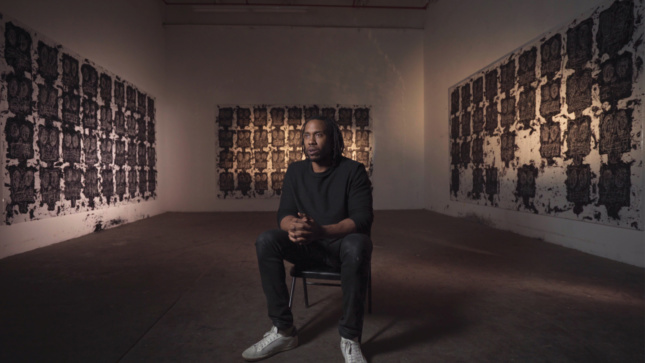 He rose quickly at age 21, then his brand fell out of favor and his challenge was to rebuild his company and his reputation in a tenuous dance between art and commerce. More consistent is Hilda, a short about octogenarian Hilda O’Connell who has been making art since the 1950s. She started in a studio on 10th St. alongside Willem de Kooning, Milton Resnick, and Esteban Vicente, and showed at the Aegis Gallery. She continues to make paintings that use language and alphabets in colorful, gestural work. At Tribeca Immersive, in Apex we see a city withstand a violent windstorm created by a looming sun. The viewer is surrounded by buildings being whipped by the elements. 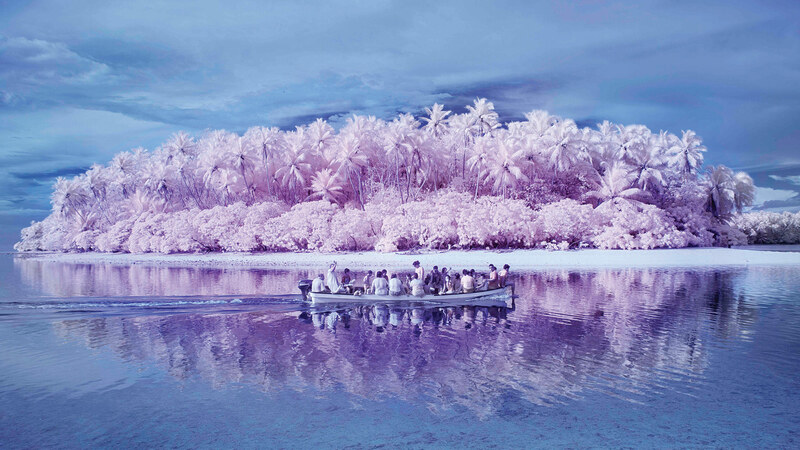 Island of the Colorblind is inspired by Pingelap, a tropical island in Micronesia with an extraordinarily high percentage of achromatopsia (complete colorblindness), a highly hereditary condition. The filmmaker says, “Color is just a word to those who cannot see it. If the colorblind people paint with their mind, how would they color the world, the trees, themselves?” The Island of the Colorblind consists of three kinds of images; ‘normal’ digital black and white photos, infrared images, and photo-paintings. Together they are symbolic attempts to visualize how the colorblind people see the world. A highlight is Hallelujah, which reimagines Leonard Cohen’s song. The experience is centered around a five-part a cappella arrangement sung by one singer with a wide vocal range in-the-round. As you rotate your head to view each rendition, the directional sound moves with you. Hallelujah employs Lytro Immerge, which enables live action VR content to behave as it does in the real world. The opening night film was Clive Davis: The Soundtrack of Our Lives, which profiles the music impresario behind the careers of Bruce Springsteen, Whitney Houston, Santana, Aretha Franklin, Barry Manilow, Patti Smith, Alicia Keys, Sean “Puffy” Combs, and more. Best Documentary Feature, Cinematography and Editing prizes went to Bobbi Jene, which follows dancer Bobbi Jene Smith’s return to the U.S. after starring for the Israeli dance company Batsheva. Also of note are: Blues Planet: Triptych, which explores music written in response to the Gulf Oil spill and performed by Taj Mahal; Bombshell: The Hedy Lamarr Story is about the screen siren who was also an inventor; actors John Turturro and Bobby Cannavale dialogue on the vital subject of hair in the aptly-named Hair; Letter to the Free is about jazz behind bars; New York is Dead depicts artists who become hitmen to ear money; Nobody’s Watching is about a successful actor in Argentina who can’t get noticed in New York; Tom of Finland is about cult artist Touko Laaksonen who comes to Los Angeles; King of Peking is about a pirate movie company run by a 1990s projectionist in Beijing; When God Sleeps is about exiled Iranian musician Shahin Najafi living under a fatwa after terrorist attacks in Europe; and two films are about war photographers, Hondros and Shooting War. And I was charmed by Auto, which takes on self-driving cars: an Ethiopian immigrant driver with 40 years experience is forced to “drive” one and picks up a couple more accustomed to the service with amusing consequences.